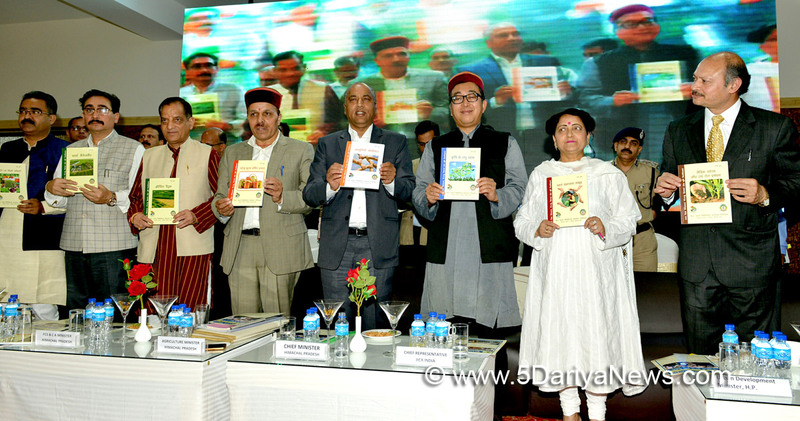 Despite limited financial resources, the State Government has proposed several new schemes for the State to give impetus to all round and equitable development of the State and its farming community.This was stated by the Chief Minister Jai Ram Thakur while inaugurating the two day National Workshop on ‘Challenges and Opportunities in Crop Diversification’ organized by Agriculture Department at Dharamshala in Kangra district today.The Chief Minister said large number of new schemes have been earmarked for irrigation, agriculture, horticulture and allied sectors to ensure prosperity of the farming community. He said that a new Scheme “Prakritik Kheti Khus-haal Kisan’ has been launched in the State to promote zero budget natural farming in the mission mode. He said that farm mechanization was need of the hour, but many farmers were not able to purchase implements such as tractors, power weeders and power tillers etc. The State proposes to establish ‘Custom Hiring Centres’ in the State from where farmers could get these implements on rental basis, he added. He said that all these incentives were to honour the commitment of our Prime Minister Narendra Modi, who has a vision of doubling the farm income of farmers by the year 2022.Jai Ram Thakur said that both India and Japan have several similarities, both cultural as well as social. He said that there was vast potential for cultivation of off-season vegetables and fruits and the State Government have created 59 market yards to ensure remunerative prices of their produce to the farmers. He said that for development of our nation we have to focus on the development of our farming community. The Chief Minister said that the Himachal Pradesh Crop Diversification Promotion Project (HPCDP) was bound to increase the farm income of the farmers of the State. He also thanked the Japan Government for financial support of Rs 266 crore in the Rs 321 crore ongoing project. He said that the most needed input for providing assured irrigation by the project with Micro irrigation in the hills and transferring of ownership of irrigation to the farming communities through formation of Krishak Vikas Association were the key of its success as the project was well conceived by the experts of Agriculture Department.Jai Ram Thakur urged the Japan Government to consider Rs 1009 crore Phase II of the project which has been submitted to JICA through the Government of India. He assured of all logistic support from the State Government for the successful implementation of this project.Chief Minister also released various publications of JICA on the occasion.Agriculture Minister Dr. Ram Lal Markanda said that the JICA ODA project was quite suitable for the hill State of Himachal as providing irrigation facility for crop diversification was a major constraint due to the topography. He said that the ongoing project has facilitated 4238 hectare area with the provision of irrigation. He said that solar water lifting pumps have been installed and the ownership of infrastructural handed over to the Krishi Vikas Associations. He said that over 1400 hectare area has been diversified to vegetable cultivation, thereby increasing income of the farmers by four to five times. He said that farm access roads, collection centres and SHGs have proved beneficial for ensuring better marketing. Dr. Markanda said that major focus of the State Government would be implementation of crop diversification plans in next two years so as to bring maximum area under diversification and thereby increase the income of the farmers of the State.Chief Representative JICA India Takema Sakamoto thanked the State Government for rendering al support for smooth implementation of ongoing JICA ODA and TCP projects in the country. He said that the JICA projects were being implemented in over 100 countries of the world. He said that several projects were being implemented in several states of the country. He said that workshops of such magnitude were vital for sharing our knowledge and experiences in the field of agriculture. He said that the presence of Chief Minister in this conference shows the seriousness of the State Government towards development of agriculture.Additional Chief Secretary Finance and Agriculture Dr. Srikant Baldi while welcoming the delegates in the Conference said that the JICA Project was a unique in itself as it focused on capacity building. He said that the Project was being implemented in five districts of the State. He said that the only option left to increase the farmers income was by encouraging them for crop diversification. He said that for this stress has to be laid on bring more and more area under irrigation facilities. He said that the JICA Project was bound to transform the economy of the farmers in the State.Director Agriculture Dr. Desraj welcomed the Chief Minister, Minister and participants to the two day workshop organized by the State Agriculture Department. He said that main objective of organizing this workshop was to promote farmers to go for crop diversification. Dr. V.K. Sharma Project Director gave a presentation on various projects being presented under the JICA Project in the State.Food and Civil Supplies Minister Kishan Kapoor, Urban Development Minister Sarveen Chaudhary, Health Minister Vipin Singh Parmar, Industries Minister Bikram Singh Thakur, MLAs Ravi Dhiman and Hoshiyar Singh, former MLA Dulo Ram, Vice Chancellor of Agriculture University Palampur, DC and SP Kangra were present on the occasion among others.